Lancaster, PA, December 21, 2017 –(PR.com)– "Persevere: A Life with Cancer," a selection of writings by Lisa Bonchek-Adams, is a book for people living with cancer and those who love and care about them. More information about the book is available at https://www.lisasbook.com/. Bonchek-Adams died from metastatic breast cancer in 2015. Her website lisabadams.com features blogs and writings on metastatic breast cancer, grief & loss, life, and family. 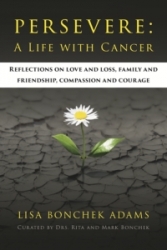 The book, which is available for purchase at https://www.amazon.com/Persevere-Cancer-Lisa-Bonchek-Adams/dp/099916290X, and her blogs, focus and focused on how to make good decisions and handle bad news, as well as how to keep going when things start to seem hopeless. She was diagnosed with breast cancer in 2006 at the age of 37, and began writing about her life as a legacy to leave for her family. She helped those with cancer feel understood, and those without cancer to understand. Bonchek-Adams coined the now famous: "Find a bit of beauty in the world today. Share it. If you can't find it, create it. Some days this may be hard to do. Persevere." When she died in 2015, her readers asked for a book that would bring together her most popular writings in one place. Her mother, Rita, and brother, Mark, curated and organized her writings into this book. In accordance with Lisa’s wishes, all proceeds from the book go towards researching a cure for metastatic breast cancer. My President Says. The Illustrated Tweets of Donald J. Trump. 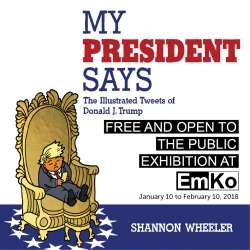 Free and Open to the Public Exhibition at EMKO Palm Beach.